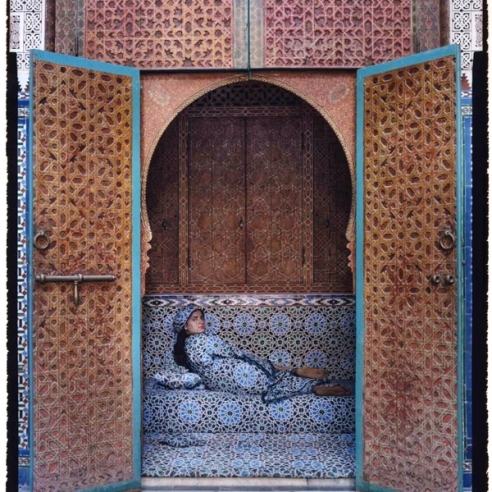 Jenkins Johnson Gallery, San Francisco is pleased to announce their second exhibition of large-scale photographs by internationally acclaimed photographer, Lalla Essaydi, featuring the artist’s most recent series, Harem Revisited and Bullets Revisited. Essaydi is currently exhibiting at Museum of Fine Arts, Boston, and at the Baku Museum of Modern Art, Azerbaijan. During New Beauty, Essaydi will be featured in FotoFest 2014 Biennial in Houston, TX. New Beauty will be on view from February 6 through March, 29, 2014 with an opening reception for the artist on Thursday, February 6 from 5:30 – 7:30pm. New York-based Essaydi, who was educated in Boston and Paris, grew up in Morocco then spent a substantial period in Saudi Arabia. These experiences with traditional Islamic life are fundamental to her unique approach of examining the identity of Muslim women. Islam, resistance, and feminism permeate Essaydi’s arresting photographs that question modern day hierarchies within Eastern culture, and the voyeuristic European tradition of depicting Arab women languishing alone or in their harem. Essaydi states “my harem is based on the historical reality; rather then the artistic images of the West – an idyllic, lustful dream of sexually available women, uninhibited by the moral constraints of 19th Century Europe.” Woeful of such Western misreprsentations of the eroticized Arab female body, Essaydi evokes these 19th-century painters, such as Ingres, Delacroix, and Gérôme, by placing her models in similar classic odalisque poses, which seres to deconstruct historical and contemporary views of Arab women in Western art. With a method she began in 2003, Essaydi covers her models, and sometimes the garmets and walls, in layers of hand-painted henna calligraphy, subverting traditional Muslim gender stereotypes through the presence of the written word. The sacred Islamic art form of calligraphy, traditionally reserved exclusively for men, is employed by Essaydi as a small act of defiance against a culture in which women are relegated to the private sphere. Furthermore, by creating this calligraphy with henna, an art traditionally employed by women for women, Essaydi fully reclaims the female voice. 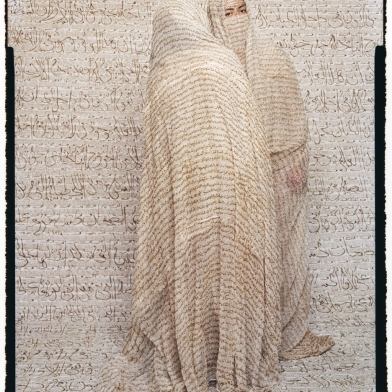 The performance of creating and the resulting stunningly beautiful yet mysterious photographs allows Essaydi to traverse boundaries between East and West, male and female, past and present. 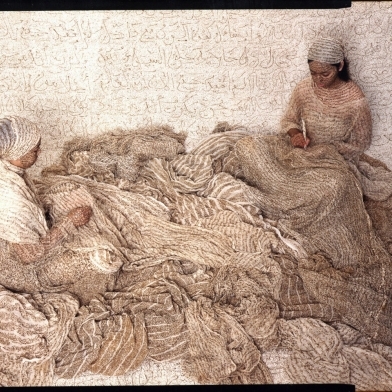 While Essaydi’s new work continues to explore themes also addressed in her earlier series, the subjects of Harem Revisited are now clothed in elaborate caftans; their surroundings covered with richly adorned fabrics turning these women into objects of decoration; props amidst an embellished environment. Loaned to Essaydi from the Nour and Boubker Temli collection, these lavish textiles were created between the 17th century and the early 20th century for use in wedding ceremonies to decorate palaces and harems, further enriching Essaydi’s interpretation of gendered practices from the past. Essaydi is in the permanent collections of Louvre Museum, Paris; Los Angeles County Museum of Art; Museum of Fine Arts, Houston; Museum of Fine Arts, Boston; The Art Institute of Chicago; San Francisco Museum of Modern Art; Smithsonian Museum of African Arts, Washington D.C.; the Arab Museum of Modern Art, Qatar, amongst others. 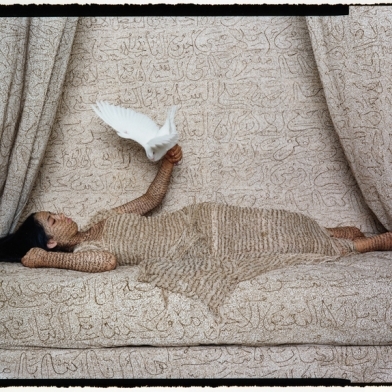 Moroccan-born, New York-based photographer Lalla Essaydi (b. 1956) explores issues surrounding the role of women in Arab culture and their representation in the western European artistic tradition. Her large-scale photographs are based on nineteenth-century Orientalist paintings, but work to subvert those stereotyped and sexualized representations. Aside from their timely and provocative subject matter, Essaydi’s photographs are technically impressive. Behind each of her images is weeks of preparation, as the text is composed, the fabrics are dyed to match the setting in which they will appear, and the architectural backdrops are carefully constructed. The entire field of the almost life-size photographs appears in sharp focus, the result of her use of a large-format camera and traditional film. A major new exhibition at the Cantor Arts Center, She Who Tells a Story, presents the pioneering work of 12 leading women photographers from Iran and the Arab world. The artists explore identity, narrative, representation, and war in daily life, inviting a broader understanding of the Middle East than what Westerners glean through media reports. The 79 photographs and two videos—a collection of stories about contemporary life—especially refute the belief that women from this region are oppressed and powerless. The exhibition was organized by the Museum of Fine Arts, Boston (MFA) and runs at the Cantor, its only West-Coast venue, January 28 through May 4. The 81 works, created almost entirely within the last decade, range in style from fine art to photojournalism and represent the women’s diverse perspectives. The photographers are: Jananne Al-Ani, Boushra Almutawakel, Gohar Dashti, Rana El Nemr, Lalla Essaydi, Shadi Ghadirian, Tanya Habjouqa, Rula Halawani, Nermine Hammam, Rania Matar, Shirin Neshat, and Newsha Tavakolian. In Arabic, the word rawiya means "she who tells a story," and through their work, these 12 pioneering artists collectively portray a region that has undergone unparalleled change and endured continuing conflict.